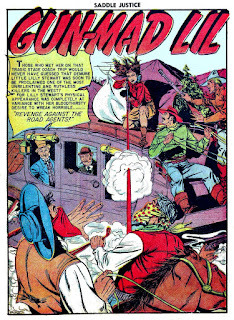 Pappy's Golden Age Comics Blogzine: Number 2254: Gun-mad Lil gets revenge! Number 2254: Gun-mad Lil gets revenge! 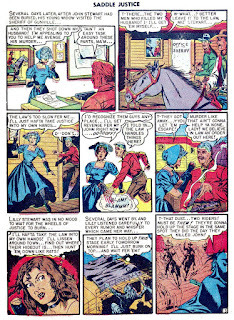 Lilly is a young bride, heading West on a stagecoach, which is stopped and robbed by a couple of road agents. 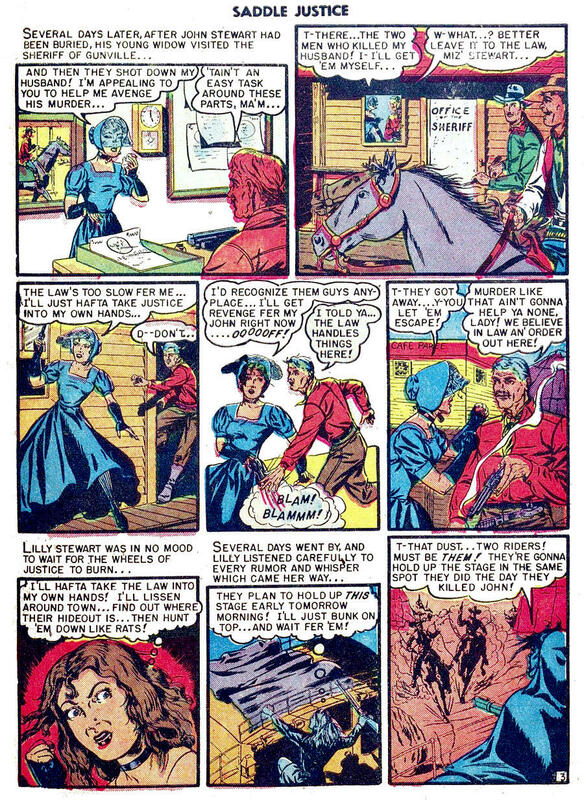 Lilly’s husband is killed. 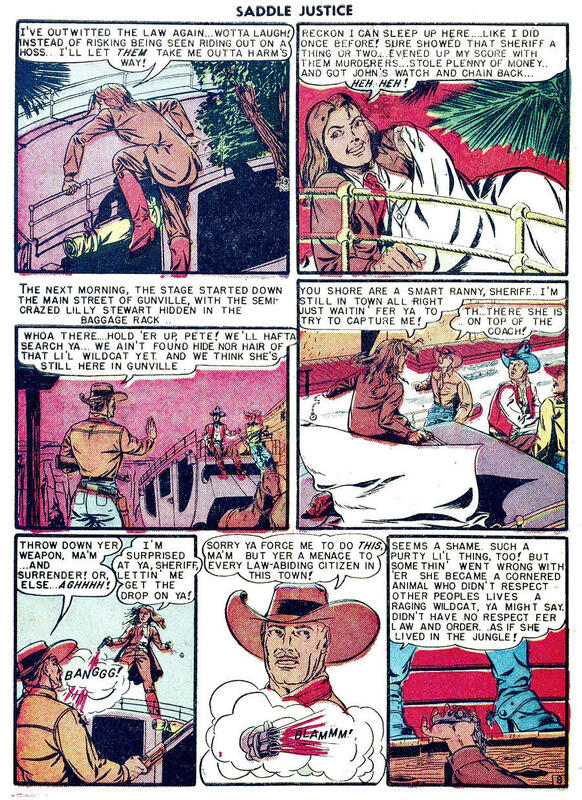 She buries her husband in Gunville, then spots the murderers as she is talking to the sheriff! 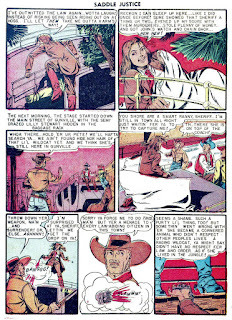 She tells the sheriff to do his duty, but he does not go into action, rather telling her while the killers ride away that Gunville is a town that believes in law and order. His idea of law and order seems to run along the lines of not chasing down criminals and holding them accountable. Lilly goes on a rampage. 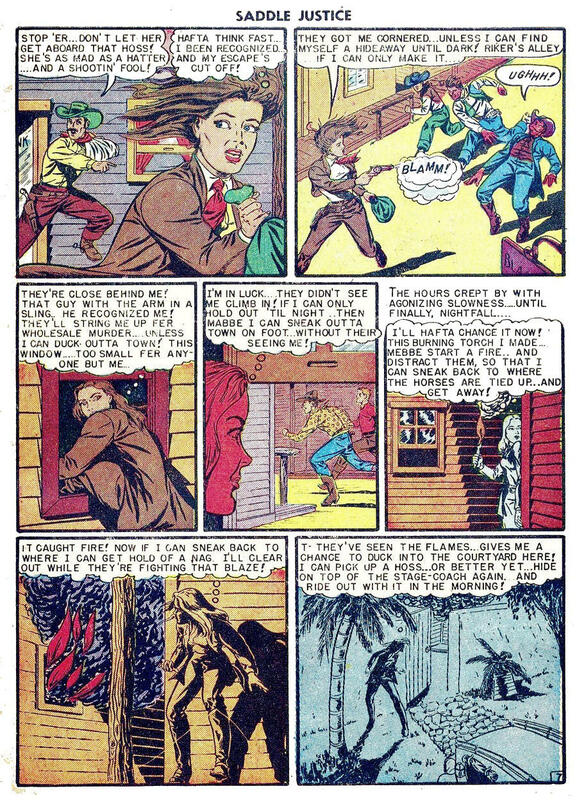 Her mind must’ve snapped because she not only kills bad guys, she kills witnesses to her killing bad guys. By then becoming a murderer herself, she has law and order visited upon her. 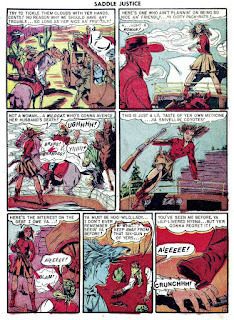 The story, “Gun-Mad Lil,” appeared in Saddle Justice #7 (1949), an EC publication, done when EC was still following trends rather than creating them, as they later did with horror comics, Harvey Kurtzman’s war comics and later Mad. 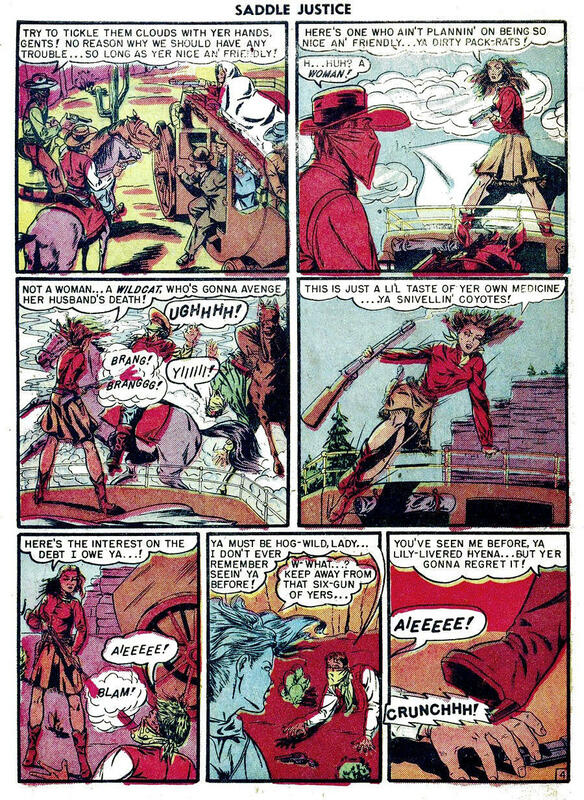 The story was drawn by Ed Waldman, who signed his name in tiny letters on the bottom of the splash panel. 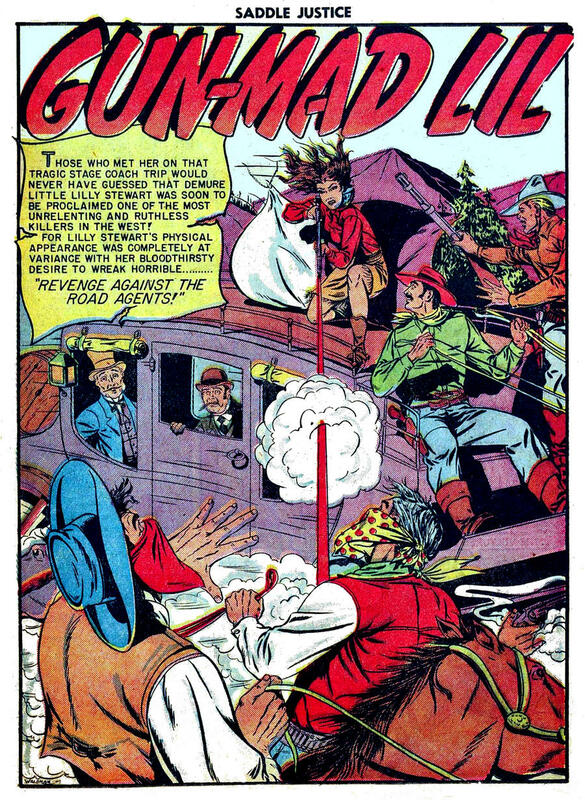 Waldman was a journeyman comic book man who did some freelance work at EC during the forties. 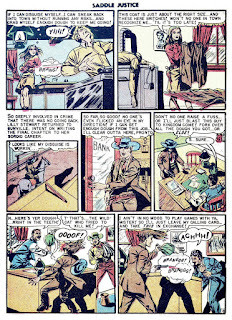 Good old west action, but one of the least believable character arcs I've seen in a while. She went crazy like a switch was flipped. "Thanks for saving our stage coach, but don't take that watch from the killer you just shot!" OK, that guy was like the idiot that would walk into a haunted mansion in the up coming new trend books! Nice art, the artist could have had a place in the horror books. Pretty good art on this one. 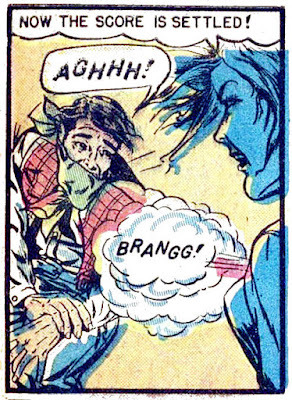 I like her close-up panels. The plot is wacky times two. Thank you so much Pappy for posting this enjoyable effort. Quite an odd story. 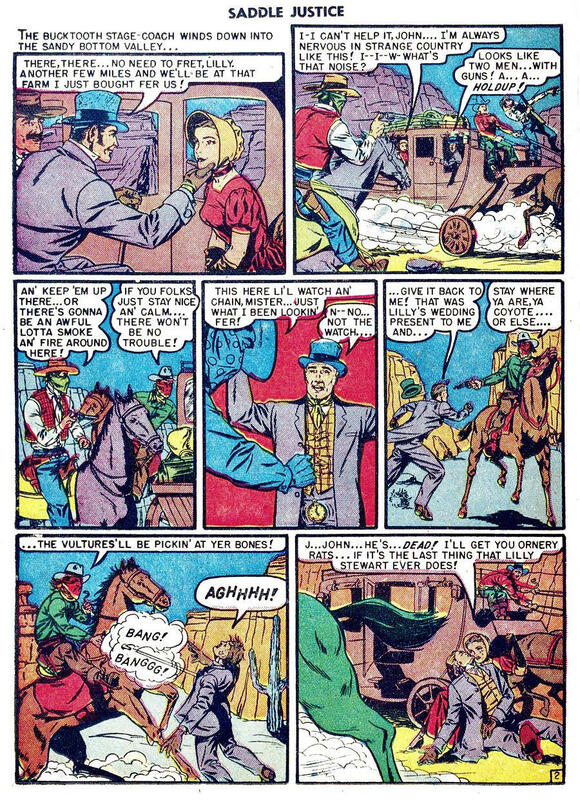 I suppose the author was emulating the crime comics of the time, and didn't really give any thought to how readers might respond to the lackadaisical sheriff, who prevents Lil from killing suspects but seems, as you say, content not to really investigate her charges. (Maybe because she's just a "hysterical female?") 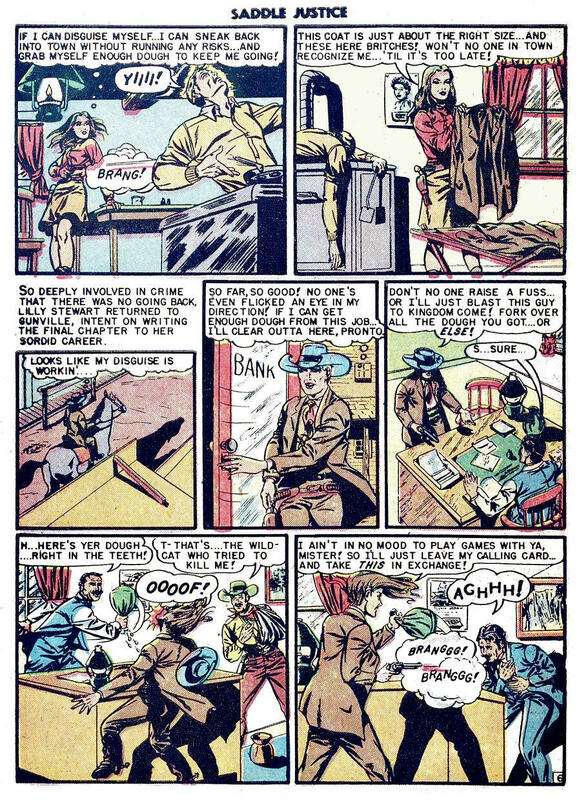 The main reason for his dilatory behavior is that if he'd been a real go-getter, Lil wouldn't have had even a half-decent motive for going on a rampage. I wonder if John Stewart knew just who he'd married? Somewhere Lilly got the idea that "the law" promised vengeance. (It doesn't. It's supposed to provide justice.) She seems like a psychopath. I don't think I've ever seen a copy of Saddle Justice. Were they all like this? It seems like a Westernized "Crime Does Not Pay". Hi Pappy, Not a big fan of the westerns, but her close-ups were well done. Brian, I guess the title isn’t “gun-mad” for nothing. Lil must have been a psychopath (see Darci’s note). Gene, Dr Wertham claimed that all comic books were crime comics. 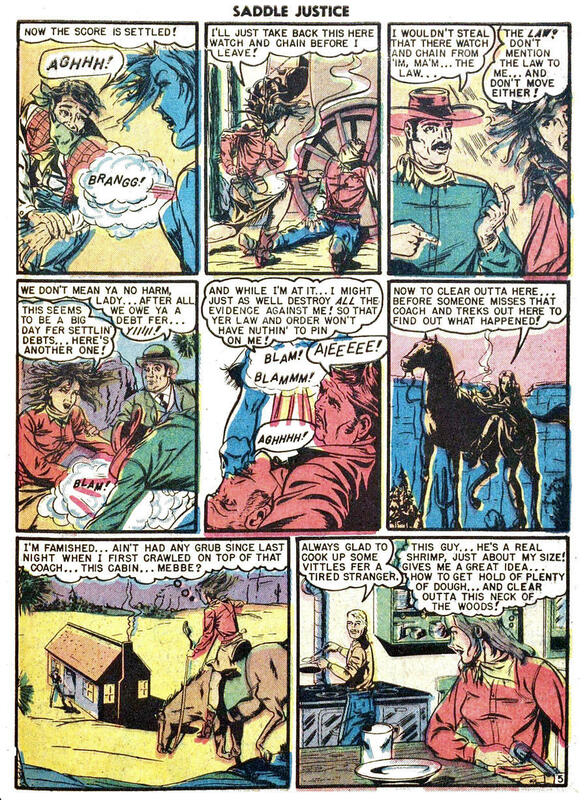 Crossing genres was common; there were a lot of Western comics that crossed-over into crime comics territory, and standard crime comics sometimes included tales from history and the Wild West. Darci, I agree that Lil was a psychopath (see my response to Brian above), and I don’t know if the writer was trying to portray her as a wronged widow going out for “justice,” or as someone who was prone to violence anyway. It isn’t clear. 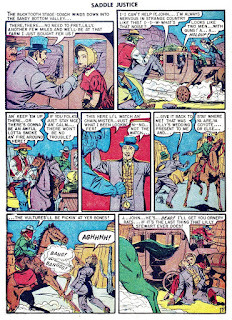 I also haven’t seen many issues of Saddle Justice. 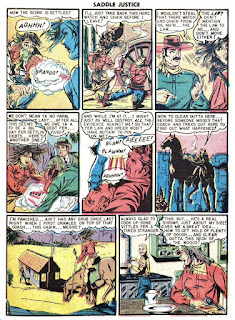 I went into my (shudder) basement looking for the 1990s EC reprints and to my surprise found I didn’t buy any of the early EC Comics except the ones that were precursors to the horror comics. I surprised myself. I thought in those days I was a completist.